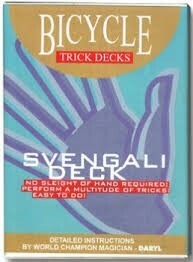 When I was in my youth, one of the first items I acquired was a deck of cards called the “Svengali Deck”. It’s a deck with one same value card repeated throughout, alternating with different cards. The deck is gimmicked that allows many different effects all done without sleight of hand. The Svengali Deck is said to have been originated by Burling Hull who was born Burlingame, Gilbert, Gault Hull on September 9th 1889 in Brooklyn New York City. He patented the deck in 1909 but many detractors claim the deck was around well before this time. 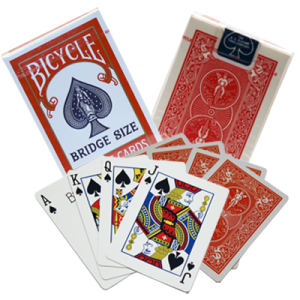 The Svengali deck became famous at state fairs and carnivals where magician’s like Marshall Brodien sold millions of these decks as a pitchman. The decks are sold even today by buskers all over the world. In the history of magic, Burling Hull is also known to have invented about 50 different magic tricks that could be performed using the Svengali, which for most magicians has become an almost essential deck of cards. It is also known as a great forcing deck. Burling Hull became fascinated with magic shortly before his 5th birthday and his father was an amateur magician. 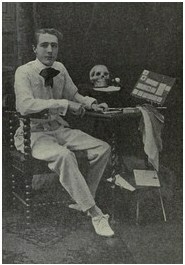 Hull gave his first performances in his early teens, performing under the name of Cliff Westfield and later used other names like, “The White Wizard” performing in an all-white suit, doing billiard ball manipulation, card magic, ventriloquism, chapeaugraphy and shadow-graphy, razor blade swallowing and even dance. His magic career soon took off and he began to perform under other names and pseudonyms like Volta, Volta the Great, Gideon (Gid-Dayn) and the Man with the Radar Mind. 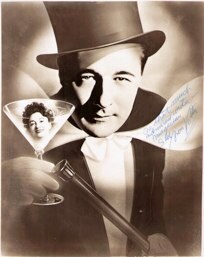 From his early days he was quite inventive and there are over 500 different magic tricks to his credit. He became known as, “The Edison of Magic” for his creativity. He wrote a number of books on magic, many of which today remain valuable instruction manuals for magicians. His many books covered topics such as sleight of hand, silk and cigarettes, manipulation with billiard balls, cut and restored ropes, mentalism, stage magic, illusions, cards and countless others making him one of the most expansive writers of his day. In performance he specialised in sleight of hand and mentalism and was very knowledgeable on all the facets of the magical arts. Burling Hull became a very shrewd business man and knew as much about business matters for magicians, as he did about magic. He was often seen at magic conventions where he would lecture on business procedures for magicians, an aspect that is often neglected by today’s performers. He was also very active as a proponent of the necessity of copyright and the use of magic patents and of intellectual rights. However he was not adverse at lifting material from other magicians then publishing it as his own, if he felt someone had stolen his own work. He published 52 books on magic, among them 33 Rope Ties and Chain Releases still regarded as a classic among escapologists, even though it was written in 1915. He co-authored “Sealed Mysteries and Sleights”, “The Encyclopaedia of Stage Illusions”, and “How to read Sealed Messages and Questions and Answers for Crystal Gazing and Mind Reading Acts”. Later in his life he wrote a huge three volume Encyclopaedic Dictionary on Mentalism (1961) that probably still remains the largest compilation of nearly every aspect of mentalism including the gimmicks, effects, specific patter and necessary sleights. During his career Hull had an ongoing feud with Robert A. Nelson the well-established magic dealer and mentalist. In his publications, Burling would often criticize Nelson for teaching mentalism tricks of the trade to gamblers, racketeers and con men who would use these methods to cheat the public. Fortunately many of Burling Hulls books are still available either as e-book downloads and from book stores like Amazon and the Book Depository. His two books on billiard ball magic are still regarded as working manuals for manipulators. His now very rare publication titled; ‘The Encyclopaedia of Stage Illusions’ was recently seen selling at over $4000 on E-Bay. Only 500 copies were printed that disclosed the methods of many illusions without authorisation with many still in use today and many of these illusions still under patent. It was forbidden to ever reprint this massive book that has now become a collector’s rarity. Hulls best patented effects was his “The Miracle Floating Electric Light” that was a very clever effect in its time and was patented in 1931. Considerable time and effort was put into its development before becoming a delightful mini stage illusion. One of Burling Hulls most important and comprehensive books is titled “Gold Award Showmanship for Magicians & Mentalists” that is still regarded as essential reading for professional magicians, semi- professional, amateur club performers and hobbyists. There are some performers today who ignore the use of Hulls famous Svengali deck but it has always been a firm favourite of mine. Because it is a gimmicked deck many tend to discard it and put it in the same category as the Nudist deck, the Menetekel deck, the Stripper deck and even the Invisible deck etc. However each gimmicked deck in the right hands can produce wonderful card effects. In recent weeks I discovered a ‘Reverse’ Svengali trick deck that can be used as a combination ‘Any card at Any Number / Prediction’ effect that evolved from the original development of Burling Hulls wonderful Svengali principal that has now led to other creative concepts. You can also purchase a combined Svengali /Stripper deck as well. I will always carry the traditional Svengali deck with me and am grateful to know just how effective it can be to entertain with. It’s what I would know as a really great magic trick deck. 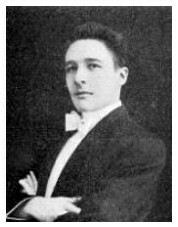 Burling Hull taught magic for nearly 80 years as well as performing mostly in the United States and lived most of his life in Deland Florida. In later years his eyesight began to fail but this did not deter him from continuing to write about magic. With the help of his friends including Bev Bergeron, well known as Rebo the clown in Mark Wilson’s, “The Magic Land of Alakazam” television series, assisted him in his last years. In 1982 he became blind and moved into a nursing home where he passed away on October 19th that year, reaching the fine age of 93. Burling Hull will be fondly remembered for his numerous books on so many aspects of magic, and they serve as his legacy in the history of magic. Burling Hull will mostly be remembered for his Svengali deck that is still possibly the most used deck of playing cards today and shows no sign of yet declining in popularity. The lesson that speaks to me is to never ignore the possibilities using a trick deck, especially the Svengali deck. It could be the best magical investment you ever make.